Place a sheet of nori on a work surface with the rough side facing up. Carefully spread 2 tablespoons of the edamame wasabi mixture over the nori, leaving 11/2 inches bare along the bottom edge of the nori (the edge facing you) and 1/2 inch bare along the top edge. Place 1 piece of the salmon, 2 slices of cucumber, 2 slices of bell pep- per, and 2 slices of avocado about 11/2 inches from the bottom edge. Top with 3 mint leaves and 3 cilantro leaves. Starting with the bare edge, roll the nori around the fillings, pressing gently to make a compact roll. Moisten a finger with warm water and run it along the inside edge of the flap that remains at the top of the roll, then press the moistened edge against the roll to seal. Repeat with the remaining ingredients. Cut each roll into eight pieces using a sharp serrated knife. Put all the ingredients in a food processor and process until smooth.Taste; you may want to add a squeeze of lime juice or a pinch of salt. Variation: If you’re up for it, go the extra mile and add another 1/4 teaspoon of wasabi powder to amp up the zowie factor in this dip. 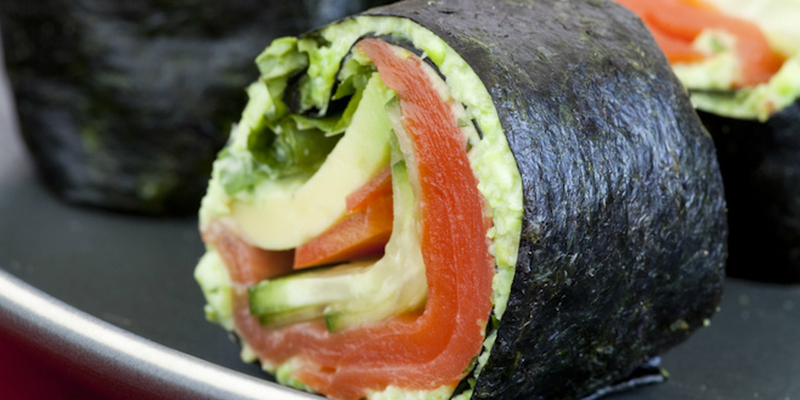 Variations: For a vegetarian nori roll, substitute thinly sliced tofu for the salmon (use baked tofu for better flavor and texture).